It was a fun week, highlighted by Benchmark Email’s trip to the Inland Empire’s Largest Mixer. Photos from the event can be seen on our Facebook page. Stay tuned next week for our next blog series, Full Court WordPress. It doesn’t matter, as long as you’re using Benchmark Email for your event marketing needs. Or maybe it does. Let Shireen tell you Which Social Media Platform to Use to Market Your Event. Not that he’s showing off. No. This is advice from someone who has put in their time. Discover The Top 5 Lessons I’ve Learned Writing 4,000 Blogs. I am terrible at planning things ahead of time. I can’t even decide what I want to eat for my next meal. That’s probably why I didn’t write this one. Check out this advice from Shireen on Holiday Marketing: Plan Now to Sell More During the Holidays. Having just covered an event this week, I can tell you, the booths that focused on what the passerbys would want, rather than their products, worked best. Or maybe I was just hungry and sought out the food booths. See why you should Center a Marketing Event Around Your Demographic, Not Your Product. Nobody puts baby in the corner, but you sure better be putting your subscribers into segments and testing them out. Discover The Importance of Segmenting & Testing Your Email Subscribers. You will not not have Aretha Franklin stuck in your head after reading this post on Obtaining a Return from Your Social Media Efforts. I thought with NASA’s budget being slashed, there wouldn’t be any launching of any sort. However, here are 5 Must-Know Marketing Tips for Launching a New Product or Service. Well...if you need me this weekend I’ll be rewatching TED Talks on Netflix. Check out these Real Life Public Speaking Tips from the Best TED Talks. I wrote a blog post, partly so my bosses wouldn’t just assume they sent me to an event and all I did was eat the free food. Check out the Benchmark 5: Things I Learned at the Inland Empire’s Largest Mixer. 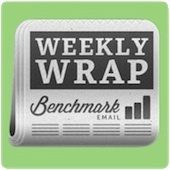 Marketing Professionals, Write Guest Blogs for Benchmark Email!